"Am I crazy, or is your brother indestructible?" Netflix has launched the first official trailer for an animated adventure comedy titled Duck Duck Goose, which is a play on the name of the children's chase game also known as "Duck Duck Goose". The story is about a pompous bachelor goose who is forced to accompany two little lost ducklings as they journey south for the winter. Jim Gaffigan stars as the voice of Peng, joined by Zendaya, Lance Lim, Greg Proops, Reggie Watts, Natasha Leggero, Diedrich Bader, Stephen Fry, Craig Ferguson, Jennifer Grey, Rick Overton, and Carl Reiner. This looks cute and slightly amusing, but definitely for kids. Plus we all know how the story will play out and all the lessons he'll learn. A high-flying bachelor goose (Jim Gaffigan) is saddled with two baby ducklings after he's grounded by an injury. They go on an adventure on their way south for the winter. 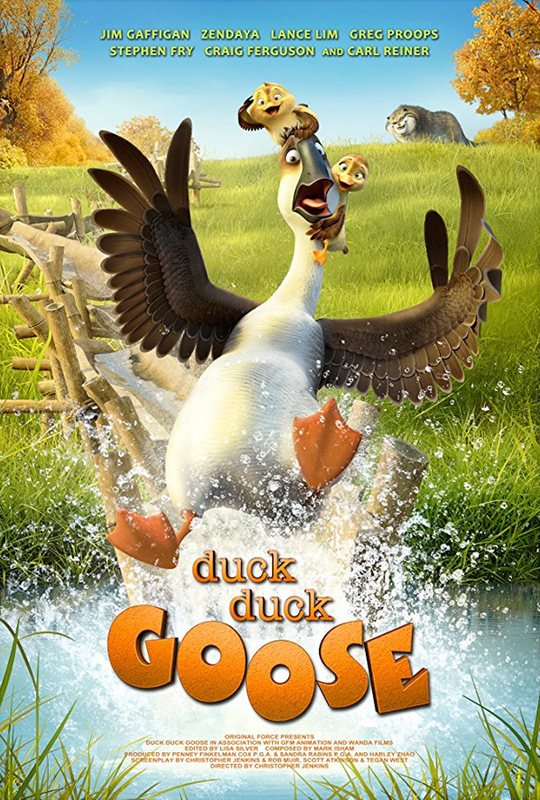 Duck Duck Goose is directed by Welsh filmmaker Christopher Jenkins, making his feature directorial debut after years of experience working as an effects animator for Disney and Sony Animation and producing a few animated films previously. The screenplay is written by Rob Muir & Christopher Jenkins, with Scott Atkinson and Tegan West; based on an original story by Christopher Jenkins. This already opened in the UK and some of Europe earlier this year. Netflix will release Jenkins' Duck Duck Goose streaming exclusively starting on July 20th later this month.